Considering a tiny home? Prefab tiny houses may be a great solution for you! Tiny houses are all the rage lately, and for good reason. 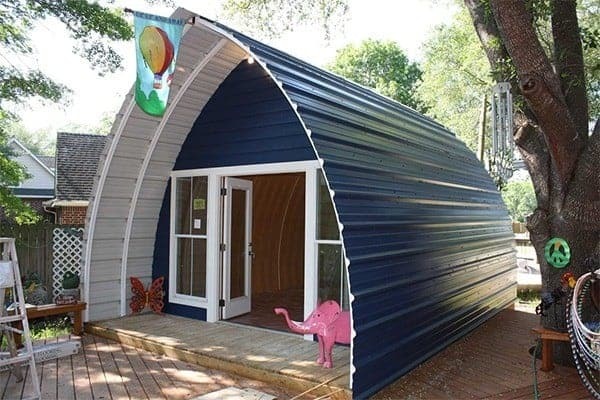 They are affordable, often environmentally-friendly, sometimes movable, and a great option for people looking to live a more minimalist lifestyle. Tiny homes may also solve some social issues such as homelessness and solutions for Veterans who need an opportunity to transition back into civilian life. But just like building a regular house, building a tiny home can seem like a daunting project, and I would imagine that most people wouldn’t even know where to begin. Well there is good news for people who aren’t ready to commit to building their own tiny home – prefab tiny houses. Prefab tiny houses are basically like really large doll houses. They are kits that come with all of the parts and the assembly instructions you need to build and assemble your own tiny home. There are a lot of options for prefab tiny houses, you can even buy them on Amazon! Of course, there are things you need to research before buying a tiny house prefab kit. The list below is just a few of the items you need to know. If you own a piece of property, make sure you understand all of the zoning rules and regulations regarding what can be put on the lot. If you plan to add a tiny home to a lot with an existing building on it, you also need to check local zoning rules and regulations. Are there utilities available for you to connect to? Will this be a permanent install? What kind of soil will you be building on? You will likely have to consult a structural engineer to ensure your foundation is not only designed correctly for your tiny house, but also meets local codes. If you will be placing your tiny home in a climate with snow, you will want to ensure your home will have adequate insulation and roof slope. A beach location with salt water will affect certain materials so you want more durable construction that won’t corrode in salt air and can hold up to more wind loads. Hot climates may want a tiny home with overhangs or shutters that can keep the sun from shining in during the heat of that day which can make cooling a challenge. 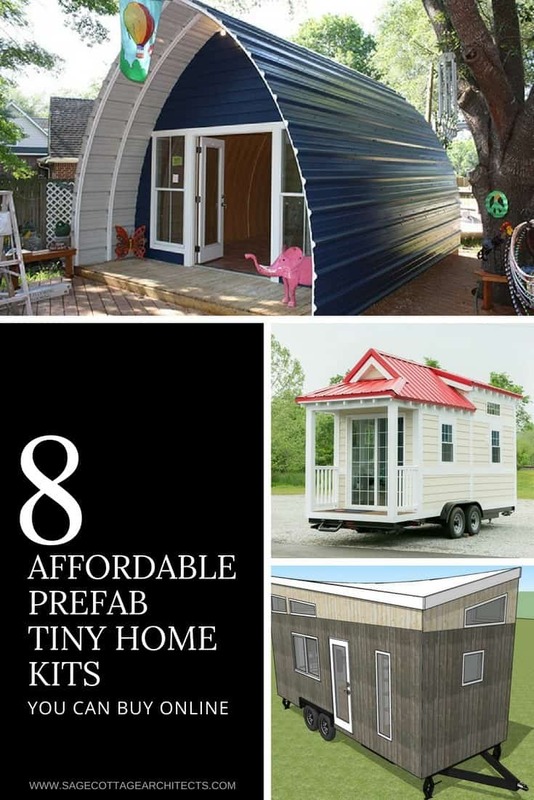 Again, this is just a sampling of some of the things you need to consider before buying a prefab tiny house. It’s a big decision, even though a prefab kit makes assembly a lot easier than having to hire an architect for design and a contractor to build it. So make sure you do as much research as possible before making your kit purchase. Take a look at some of the prefab tiny home options available that you can order online. The ones featured here are true kit homes with prices ranging from around $7,000 upwards of $35,000. You order them and they are shipped to you in pieces and you assemble it yourself. Some of them are just the finished walls and roof and floors and do not include things like toilet fixtures and kitchen cabinets. Most of them don’t include utility hook-ups and some do not include shipping costs. This prefab tiny house kit is 292 s.f. plus a sleeping loft. The kit includes a small deck and takes approximately 2-3 days for two adults to assemble. Only minimal tools are needed for this kit, and it includes all wall, floor and roof finish materials so no interior finishing is needed. It also includes windows and door, all screws, handles, locks, etc. The kit does not include kitchen or bathroom fixture or cabinets. So keep that in mind when considering how this kit will fit into your budget. The manufacturer recommends additional insulation for cooler climates. Kanga Room products come in two main styles , Modern and Cottage. Each style comes in a variety of different sizes and options. They sell their homes in a number of different ways, one of which is a shell kit that can be shipped to most U.S. states. Pricing for a 320 s.f. shell kit ranges from $14,000 – $24,000+. Kanga Room kits come with shell materials, windows, doors, roofing, siding and entry steps. Interior walls, finishes, accessories, wiring, plumbing, cabinets, etc. are not included. Texas residents have additional options through Kanga Room Systems for basic shells and turnkey structures fully installed. The Paradox Tiny House is a house on wheels. It sits on a 22′ trailer. 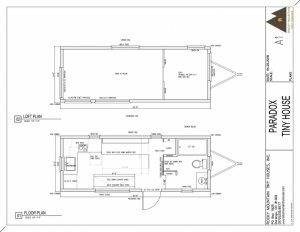 Rocky Mountain Tiny House kits come with a custom trailer with a lifetime chassis warranty, subflooring, wall framing system (your choice of wood, steel, insulated panels or logs), wall sheathing, roof decking, weather barrier and complete construction documents. Available add-ons include exterior sheathing, metal roofing, doors, windows, loft materials, interior wall finishes, floor finishes, appliances, cabinets and fasteners. 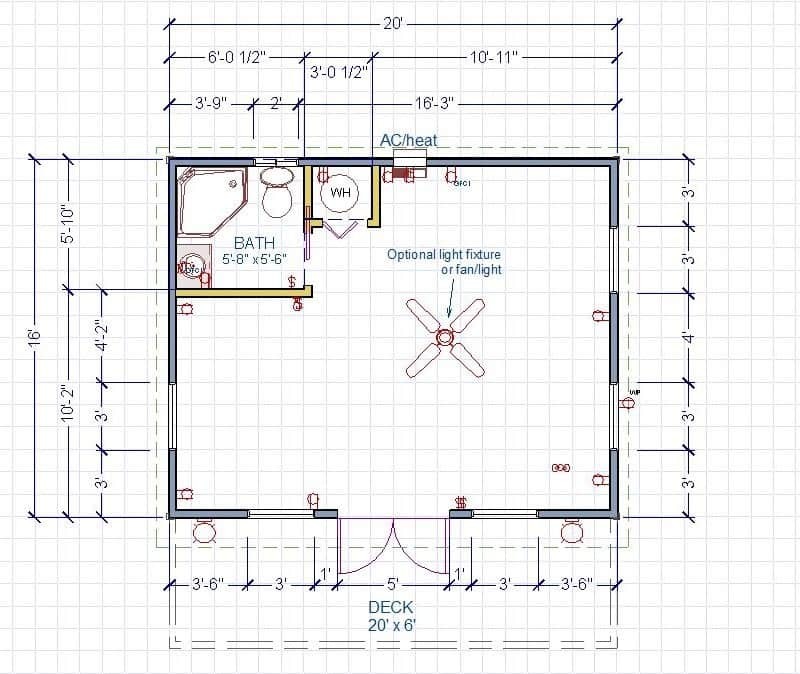 Basic kit starts at $12,500 all the way up to $58,000 for a turnkey tiny home. This expandable tiny home is designed to resemble a container home which is something that is growing in popularity. 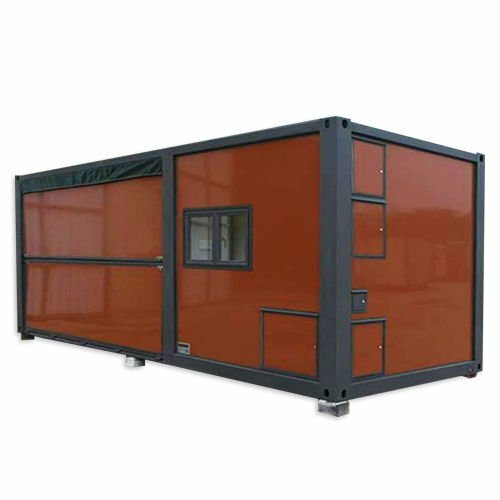 It is made of a hot galvanized light steel frame with sandwich panels, walls, doors and windows. It also has solar panels on the roof for power. This home assembles quickly, is fire resistant (grade A fire rating) and is easy to set on even the most simple foundations such as concrete block. It is wind-resistant (level 11) and anti-seismic (grade 9) and the solar panels can charge fully in around 10 hours depending upon local climate. 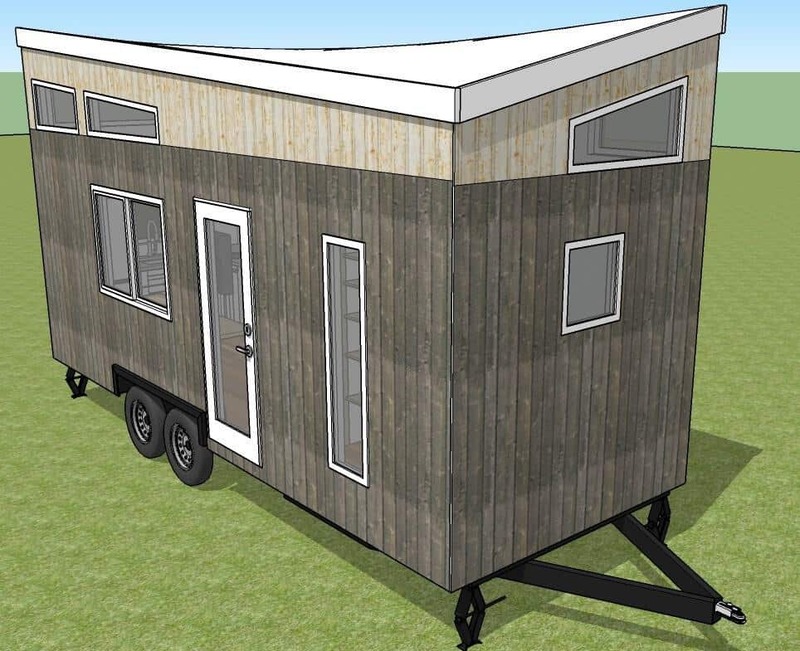 This prefab tiny home kit may come from overseas so keep that in mind when ordering. 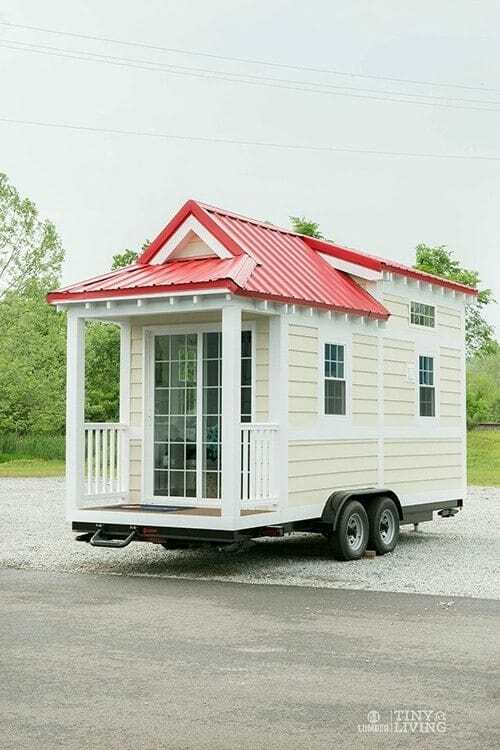 84 Lumber has a line of affordable tiny homes that come with the reassurance of buying from a brand that has been around for awhile. Founded in 1956, 84 Lumber has over 5,000 employees in stores across the country. Their new line of Tiny Homes offers a greener environmental footprint in a high quality package. 84 Lumber has 4 different tiny homes available, all under 210 square feet, all with completely different styles to appeal to everyone. All 84 Lumber tiny homes are designed on a custom trailer for portability. Their Shonsie model is an adorable, bright and airy cottage style home with a contemporary beach flair. 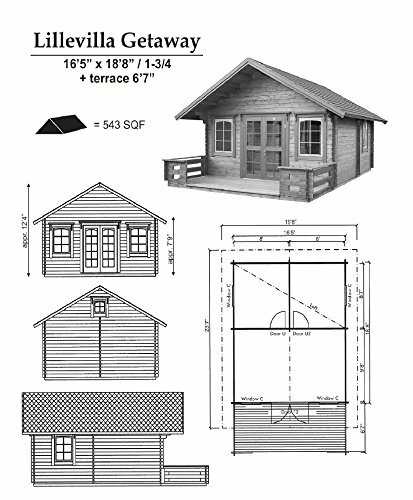 Tiny homes from 84 Lumber are available as build-your-own, semi-DIY or move-in ready. The base kits include a custom trailer, architectural blueprints, and a complete materials list. For the Shonsie model, this basic starter build-your-own will run you about $6,900 + tax and delivery. A semi-DIY Shonsie kit is around $23,000 + tax and delivery. The semi-DIY kit includes everything from the build-your-own kit plus the house shell including windows, door and a shower. Allwood has a great selection of prefab tiny houses. 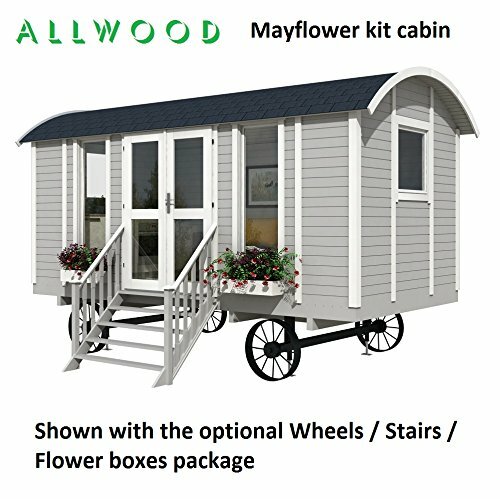 The adorable Mayflower from Allwood is a cozy cabin that looks like a vintage wagon. Assembly can be done in a day with two adults. This tiny home comes with all of the wood and fasteners required to construct it. It also comes with doors and windows and all hardware. You will have to provide interior finishes, roofing finish material, and bathroom and kitchen accessories. It’s unclear if it includes electrical wiring or not, but I would imagine that it does not include any electrical wiring or plumbing fixtures. This model is available without the wheels for a lower price. It’s hard to tell, but the wheels on this unit look more decorative than functional. This would make the most adorable granny flat! These are probably the most unique prefab tiny houses out there. They come in a whole slew of different sizes from sheds and studio apartment sized to cabins with 3-4 bedrooms and 2-3 bathrooms. Each of the Arched Cabins sizes comes in multiple lengths allowing for any number of different size configurations. The wider the cabin, the taller it will be. Pricing on these units varies widely. The base price starts around $4,400 for a small cabin, with a long list of available extras depending upon your needs. Arched Cabin kits include floor plates, ribs, ridge beam, standard R13 insulation, Super Span Roof Paneling, trim and fasteners needed to assemble the cabin. They do not include the foundation, installation, interior, end caps or delivery. These are definitely a unique, affordable option for someone looking for a tiny home. This container house is the most utilitarian prefab tiny house on the list. It pretty much looks like it was just taken off a train after being used as a storage container. It shouldn’t turn you off though, this would look really cool in a number of different settings. This tiny home comes fitted with power and lighting, and it is made from a recycled shipping container so it is environmentally friendly. It is unclear how shipping works or what you get with this kit. 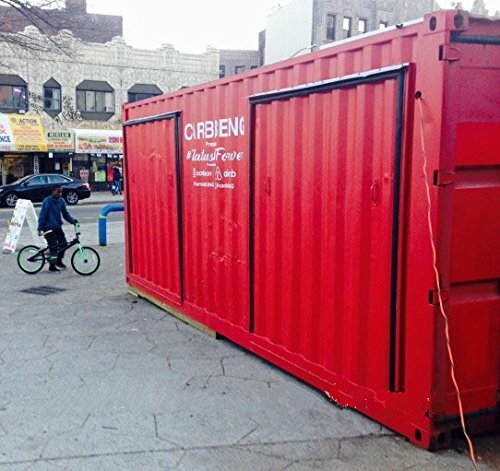 For the money, I would assume you get the shell container with the framed openings, wired for power but that you would be responsible for the build out to finish it and make it livable. The listing isn’t clear, but it’s an interesting solution for a number of housing needs. Prefab tiny houses are the wave of the future. They can potentially help solve a lot of social problems, increase sustainability efforts, and help people experience home ownership without a lot of the expenses that come with a larger home. They are a great option as a rental unit on your property to earn extra income or as a granny flat for still independent older family members that you’d like to keep close to home.